I love roasting chicken or any other type of protein. The end result is a meal that seems like you spent hours making it, – which you may have done but the oven does all the work. The actual prep time is very low. 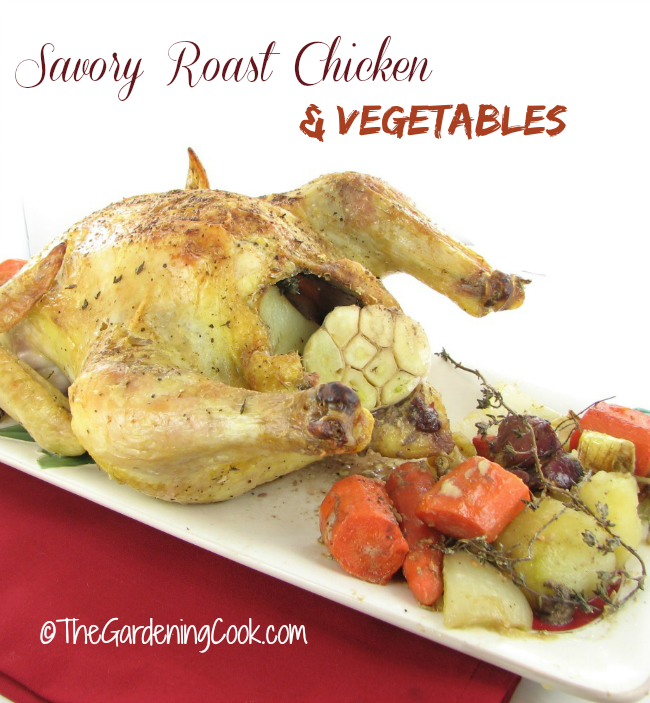 This savory roast chicken recipe is one that my family loves. One thing that I especially like about roast chicken is that you can roast vegetables at the same time. And, for me, there is nothing like the sweetness of roast veggies, particularly carrots and onions. Once you have roasted them, you will never boil or microwave again! This savory roast chicken does not need much in the way of seasoning. I use coconut oil, to help the outside brown well, and add a nice flavor. 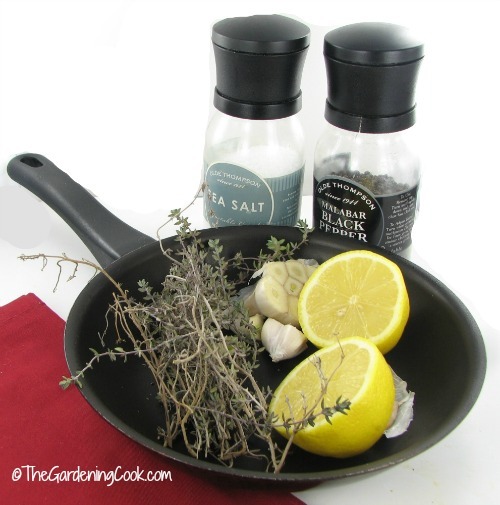 The seasoning is just a bunch of thyme, a head of garlic, a lemon, and some Mediterranean salt and cracked black pepper. It all just goes in the cavity of the bird. How easy is that? I normally cook a chicken about 20 minutes per pound plus an additional 20 minutes, but a handy meat thermometer will tell you when it is done. 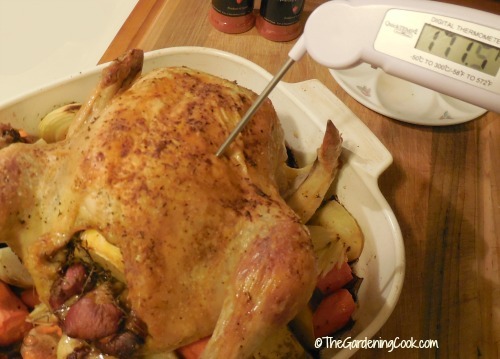 This Quick Temp digital thermometer makes sure that your chicken will be perfectly cooked. (affiliate link) Just insert it into the meatiest part of the bird, (being careful not to touch the bone) and it’s done when the thermometer reads 175º F. Mine needed to go back into the oven for some more cooking. But don’t let the simplicity of the recipe fool you. 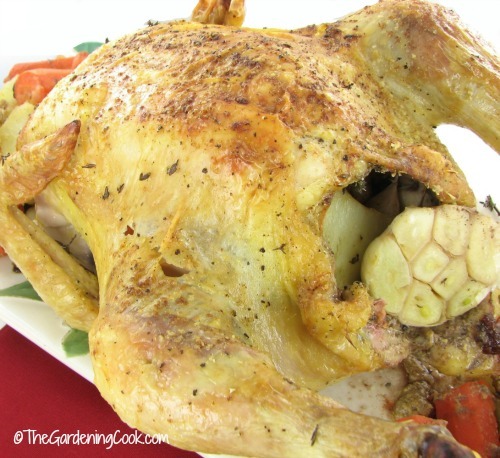 This savory roast chicken is full of flavor, and all that will be left when the meal is done is some picked over bones! The garlic and lemon added so much flavor to the roast. I received my Quick Temp Thermometer free in exchange for reviewing it as a part of my recipe. (affiliate link) I only recommend products that I feel my readers will enjoy. Quick temp has graciously agreed to give one of these handy thermometers away to a lucky reader of my blog. The thermometer is great for both indoor and cooking outdoors on the grill. No kitchen should be without an accurate thermometer. The contest ended on April 6 at 12 a.m.
Marilyn N was the winner! Rinse the chicken inside and out, and pat the outside dry. Season the inside of the chicken with Mediterranean sea salt and cracked black pepper. Stuff the cavity with the bunch of thyme, the lemon, and the cut garlic. Brush the outside of the chicken with the coconut oil, and season again with the salt and pepper. Place the onions and slicked carrots in the roasting pan. Season with salt, pepper, 6 sprigs of thyme, and a bit of olive oil. Spread around the bottom of the roasting pan and place the chicken in the pan. Roast the chicken for 1½ hours, or until the juices run clear when you cut between a leg and thigh. I use a meat thermometer to make sure the internal temperature of the chicken is 175 º. Place the thermometer in the meatiest part of the bird, being sure not to touch the bone. Remove the chicken and vegetables to a platter and cover with aluminum foil for about 15 minutes to let it rest. Carve the chicken and serve it with the vegetables. Nice giveaway. Love the recipe. The roast chicken recipe looks awesome. I am always trying to find a new way to cook chicken, this one is a absolute must! I would love to try out your digital thermometer And the savoury chicken recipe looks awsome. Hi Lorraine. My sponsor has agreed to allow international customers to participate but I don’t know whether the contest widget allows this. Did you try to enter with your Canadian address? Sounds delicious! I would love to have to have a digital thermometer!! Yum, roast chicken sounds delicious. Would love to win the thermometer, thanks! I use mine all the time, Connie. Good luck if you decide to enter the contest. There is a form at the bottom of the recipe page. Yummy recipe with good flavors in it. I am having a problem with the contest widget. It gives me points for the last five entries. But no matter how many times I try the “share promotion on FB” link it still shows zero points for that entry. It also changes my name in the form to my twitter name when I do that entry. Very strange. Thanks so much for the giveaway– this type of giveaway entery is so hard to get it to work but I tried just wouldn’t let me do them all. I’m sorry to put you to trouble, and I’m sorry for complaining, it was just frustrating. Hi Dianna. It is no problem at all and I need to know if there are issues like this. I have one more that is ending tomorrow night with the Tomoson widget (the muffin top muffin cups) but after that, all the other giveaways will be done with Raffle copter and I am adding a “name and address” field as an entry too. i love the idea of a digital thermometer!